Garner Magnet High School, just outside Raleigh, North Carolina, has more than 2,400 students, with overflow classrooms in 14 standalone trailers on the 100-acre campus, and 48 more classrooms in temporary modular units. A few years back, the school district purchased an old movie theater across the street from Garner and converted it to a ninth-grade academy, where the school's 700 freshmen spend most of their time. Conventional wisdom is that Garner is too big to succeed — too big to deliver the attention that needy students require, and too big to police. In Rochester, Garner, almost half again the size of East High School (our largest), would long ago have succumbed to the toxic air of failure that poisons our high-poverty schools. In Rochester, the ed EMT's would have first tried to revive Garner with a "reorganization plan" — which would likely mean converting the big school into two or three smaller schools housed under the same roof with a promise of better days ahead. Or the state would have decided, as it has with East, to shut it down so the school board could entertain proposals from so-called turnaround experts employing the shopworn Rochester strategy of conflating boosterism with healthy, informed optimism. An optimist sees the obstacles to solving a problem and finds ways to overcome them and succeed; a booster doesn't care about reality, wears a big smile, cheers loudly, and dismisses all critics as naysayers. For the record, I am an optimist. But I am an old man and I long ago ran out of patience for school district and city officials who insist, despite our 40-year slide to educational catastrophe, that the city schools can fix themselves. 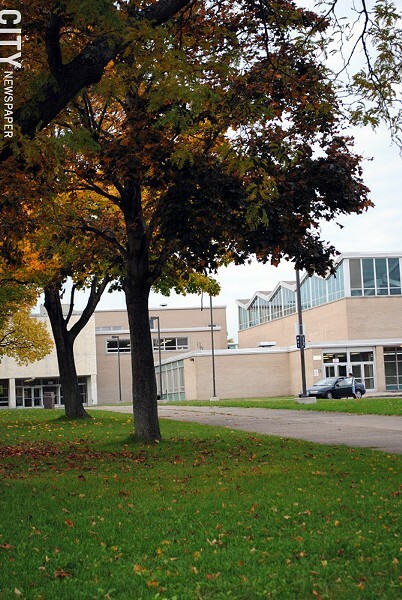 The decision to place East High in the hands of the University of Rochester is unlike anything the district has tried before and may yield ideas and approaches that could be part of a genuine turnaround. It's far too early to know, but an optimist would keep an open mind. Garner has no metal detectors (too many doors to police, says the principal, Drew Cook, and besides, there's no need for tighter security). Garner is not friction-free. Cook told a group of Rochester visitors recently, "If you'd been here yesterday, you'd have seen us seen trying to head off a gang fight." (They did). But Garner works quite well. They knew that without consolidation, Raleigh would soon be left with all-minority, high-poverty, failing schools without the resources to turn themselves around or ever again attract businesses with employees who want good schools for their children. So Raleigh's leaders did the right thing: They merged school systems and hoped voters would forgive them down the road. And mostly, they have. Consolidating schools is a straightforward way to move toward economic integration, but not the only way. Besides, while state law in New York permits, even encourages, small city, suburban, and rural districts to merge, there is no clear path for the Big Five city school districts to consolidate with neighboring districts. An effort to change that would be long, divisive, and probably unsuccessful. Why not look for other ways to achieve the same outcomes? We cannot replicate the Raleigh-Wake County experience, but we can see from that history the value of working to eliminate high-poverty schools. I am part of a group convened by Urban Presbyterians Together (which advocates regional communitywide solutions to urban problems). This new group — the Great Schools for All Coalition — consists of educators and other professionals with a long-time passion for reforming Rochester's city schools. We're hoping to spark a community conversation, and — fairly quickly — some actions to deal with the persistent failure of Rochester's high-poverty schools. On a three-day fact-finding trip to Raleigh in April, we met with current and former school and elected officials, business leaders, teachers, parents, and students. We visited three schools and are sifting through our collective notes to see what lessons we can find for Rochester. I'm not speaking here for the group; I'm only sharing my observations. As more than one of our hosts pointed out, Raleigh is not the whole of North Carolina. Wake County is a Democrat-friendly, fairly progressive region in what is becoming a bright red state. In 2009, a Tea Party slate took control of the Wake County Board of Education and immediately set out to reverse many of the reforms — the board pushed for a return to neighborhood schools, for example. The about-face shocked the county's progressives into action and led to the formation of new organizing efforts that restored a Democratic majority two years later. And Raleigh is not Rochester, which became a prosperous city because of hundreds of small and large homegrown manufacturers producing everything from yellow mustard to lenses that can see into deep space. The prospect of good-paying jobs drew thousands of blacks north in the 1950's and 1960's. Many of them settled here, but found neither good jobs nor decent housing. As the middle class moved out, the City of Rochester became poorer and the schools slipped into mediocrity and then into calamity. Like most of North Carolina, the economy of Wake County outside Raleigh was once dominated by tobacco, textiles, and furniture-making. But by the 1960's that began to change with the development of Research Triangle Park, which drew major technology companies to an area defined by university hubs in Durham, Chapel Hill, and Raleigh. But the economy in Raleigh, the state capital, was and still is dominated by state government and now also by medical research. Theirs is increasingly a knowledge economy with very few exports. Poverty was not merely an urban problem, although Raleigh still has its share of very poor neighborhoods. Wake County has lots of rural poverty. Indeed, in recent years, the business and political sectors have focused on rebuilding the urban core — downtown and its surrounding neighborhoods — often displacing low-income families, who have been forced to look for housing outside the city, in more rural areas where affordable housing is in short supply. So while Raleigh and Wake County have invented a school system worth mining for ideas, the community is no utopia. That said, I was impressed with how deeply the community values economic integration — not as some gauzy abstraction, but as a central tool for understanding how others live and think, and for continued growth. At Joyner Magnet Elementary School, a Spanish language immersion school in the heart of Raleigh, parents told us that the school, once derided as the "Joyner Ghetto," has dramatically improved academically and has helped spark new confidence in the city's public schools. Young families have returned to the area. Dilapidated rental homes have been replaced by new, upscale homes. 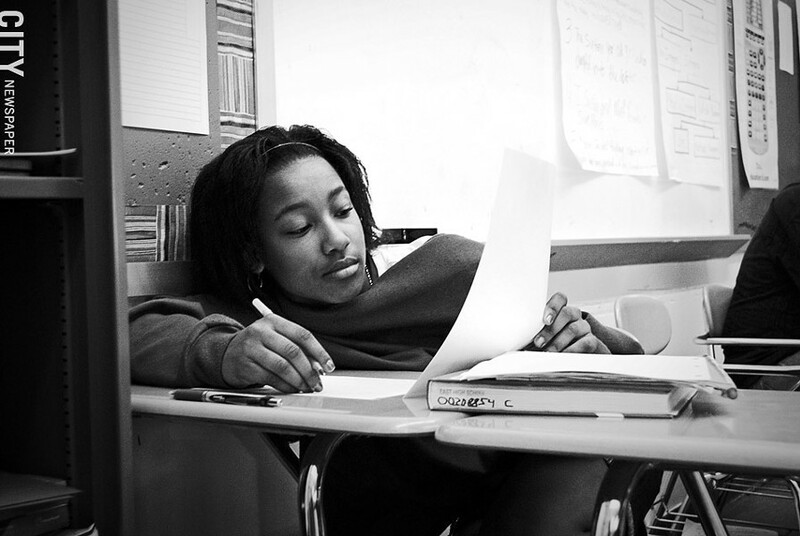 A student in a creative writing class at East High School. One Joyner dad said he had persuaded the home-building company he works for to add dozens of new homes adjacent to the Joyner campus. He said he was sold on the new Joyner by a conversation he had with his third-grade son who was telling dad about his best friend. "Is he white or black?" dad asked. The son thought about it, but said he didn't know. That's just the way this parent wants his child to see the world. In 1976, the newly minted Wake County district had about 50,000 students. Today, the district has 150,000 students in 170 schools, spread out over 800 square miles. (Rochester, by comparison, is a compact 36 square miles, while Monroe County's land mass is 657 square miles.) The Raleigh district is growing by 3,500 students every year (largely a combination of Hispanic immigrants and employees of high-growth companies) and is constantly building and rebuilding schools to accommodate the steady stream of new families. Initially, the consolidated district set out to racially integrate all schools, but by the 1990's, it was clear that court challenges to "forced busing" might overturn the balance that Wake County officials had worked hard to achieve. They moved instead to integrate schools along socioeconomic lines, agreeing that poor students should not exceed 40 percent of any school's population. That mix, which has become ever more difficult to maintain, was based on research by the Century Foundation's Richard Kahlenberg and others who found that the 40 percent number allows teachers to provide the necessary supports for educationally disadvantaged students without jeopardizing the success of the middle class or affluent majority. It is not, however, a magic number. Wake County uses 34 magnet schools to entice suburban parents to send their children to city schools. This, in turn, has helped revitalize urban neighborhoods. It's pretty simple when you think about it: Young families know that wherever they live, in Raleigh or its suburbs, their children will have access to really good schools. "Schools are essential to our marketing," says John Wood, a former president of the Wake County Realtors Association. "When we invest in our school system, we're investing in our community." The magnets are central to a voluntary integration strategy, and the district is regularly looking for new programs to pull families to the schools — engineering, arts, science, and international studies, among them. The district has launched "early college" programs in several of its non-magnet or "base schools," offering a fifth year of high school that includes tuition-free college courses — enough for students to complete an associate's degree or two years of college credit to apply toward a four-year degree. The magnets, by freeing-up seats in other schools, have allowed the district to provide a mix of lower and higher income children in all its schools, and to improve academic outcomes across the board. Raleigh may have experienced an educational epiphany in the 1970's, but the decision to consolidate was also pragmatic. Thomas Bradshaw, Raleigh's mayor from 1971 to 1973, told us: "Our business community could see that we had to act. If we didn't do that, we'd be in a real world of hurt. IBM and others had come in, and we had to change." So how do the students, especially the poorest of them, do? The number of economically disadvantaged students at Garner — 50 percent — exceeds the ideal of 40 percent, but the four-year graduation rate of 80 percent is close to the district average, as are the grad rates for black students (69 percent), Hispanic students (66 percent), and economically disadvantaged students (65 percent). Wake County school officials are not satisfied with these numbers. But Rochester educators would die for them. While Garner students are more segregated within the school than Principal Drew Cook would like, in large part because more of the students in advanced classes come from the most affluent families, "they still walk the same halls, participate in the spring musical, and play on the same athletic fields," Cook says. That's not ideal, but from the admittedly limited experience we had on our visit, the classrooms seem more integrated than those in either city or suburban schools in Rochester and Monroe County. No one we spoke to in Wake County sugarcoats the problems. The testing gaps are far too high. There is a constant struggle to maintain a socioeconomic balance in schools (some schools have poverty levels above 50 percent) while addressing parental concerns that their children not be moved from school to school to achieve that balance. And each year brings thousands of new students in the schools, many of them poor and non-English speaking, which complicates the pursuit of integration. The challenge is compounded by finances. Per-pupil expenditures in Wake are about $8,400 this year (in Rochester, it's over $19,000), and the biggest reason is compensation. In North Carolina, teachers are state, not school district employees and they are not represented by unions. Wake County and many other districts tack incentive pay onto the state minimums to attract teachers. But even with that, a starting teacher, hired at $35,189, would have to work 36 years to reach $62,000. And this year, the General Assembly voted to phase out the traditional pay bumps for teachers with master's degrees. Poor pay is making it harder to attract and retain qualified teachers, and within the last year, 600 of Wake County's 9,000 teachers left their jobs, most for financial reasons. But Wake County is struggling forward, while Rochester is just struggling. Integration has dramatically improved results in Raleigh, and helped build a community consensus that public schools are one of the county's best assets, not its chief liability. Former Wake County superintendent Del Burns puts it this way: "People always say to me, 'How does sitting next to a rich white kid make a poor black kid smarter?' It doesn't. But the parents of those richer kids will bring pressure to make sure those schools have the resources they need." Lynn Edmonds, a member of the advocacy group Great Schools in Wake, and the mother of a middle schooler and a high schooler, says economic integration "gives your children the benefit of being around children who are not just like them. I would encourage them (parents) to embrace that." Edmonds and other middle-class parents say that integration has taught them and their children to appreciate the assets each child brings to school (fluency in Spanish, for example) and not to see poor children as recipients of suburban largesse. What I learned from Raleigh is that building and maintaining an urban school system that gives all children, regardless of their ZIP codes, access to great schools is hard work. But that commitment to high-quality schools has reinvigorated city neighborhoods and become a source of community pride and confidence about the future. Rochester is not Raleigh and will have to find its own path. The hundreds or thousands of volunteers, many of them suburbanites, who tutor or otherwise assist in Rochester schools do important work and, as many of them will tell you, receive more from their time with the children than they give. That impulse to help is to be cheered and encouraged, as is the work of the city's many dedicated teachers and principals. City school board President Van White says he recognizes that the concentration of poverty is the elephant in the living room, but adds that "there is such a huge margin for improvement" that there are steps the district can take on its own to improve outcomes. So have at it. But none of these efforts will "fix" the city schools. We must find a way to economically integrate our schools with middle class, affluent, and poor students in the same classrooms. We're going to have to build partnerships across district lines and open schools that parents of all economic backgrounds can support. And time is running out. We can go where the research leads us, or ignore the data to our peril. Rochester has become what the people of Raleigh and Wake County acted to avert 38 years ago: a cluster of high-poverty failing schools in neighborhoods largely abandoned by young and middle-class families. Am I angry? Yes, and you should be, too.